Manhattan’s seafood-centric French-Canadian restaurant embodies north-of-the-border hospitality. 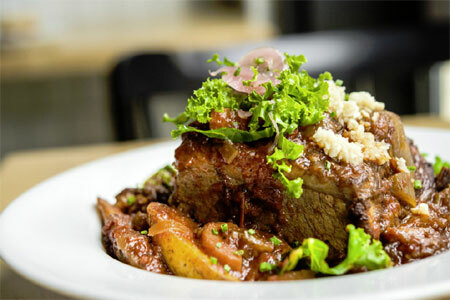 : Chef Adriano Ricco (formerly of Buzina Pop) offers an inviting exploration of French-Canadian cuisine at Le Pescadeux, the only restaurant in Manhattan where the Canadian migration to Cajun country is seen in culinary combination. The comfortable room, its glass doors open in milder weather, is adorned with art boasting French symbols and seaside murals. Putting a new spin on America’s penchant towards grazing menus, Ricco offers a main course made up of two half-portions, a duet of seafood, so you can try both halibut and dorado, or walleye pike and flounder, if you so desire. Classic French-Canadian specialties reflect their cold-weather origins with hearty sauces and preparations for the most part. A Cajun twist is given to traditional poutine, that stick-to-your-hips concoction of french fries, gravy and cheese. East Coast oysters offer a lighter starter as does the mackerel ceviche. A standout among the non-seafood items is the lamb porterhouse, prepared with a Madeira reduction and more tender than its beef cousin. On the dessert menu, sugar pie, a sweet-tooth must for anyone familiar with Quebecois cuisine, blends beautifully with a glass of Riesling ice wine. The wine list is equally divided between North American and European selections.